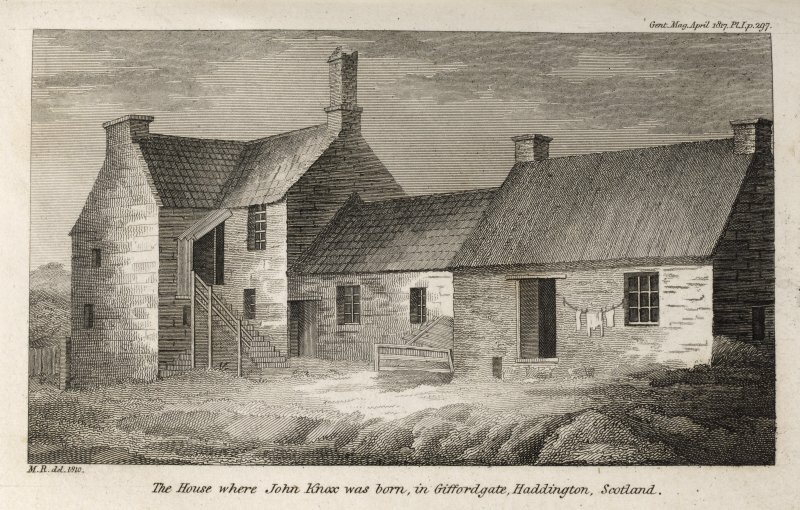 According to the OSA, John Knox was a native of Haddington and the house in Giffordgate in which he was born still remained. Miller, however, states that this is based on the fact that a family called Knox lived in a house in the Giffordgate; this family did not go to reside there until 3 years after the reformer had died in 1572. The ONB uses the above authorities only and identifies the house as "John Knox's House, Site of (Supposed Birthplace of the Scottish Reformer)". At NT 5203 7366 is a mature oak tree encircled by a low stone wall surmounted by a railing. A large stone slab rests against the inside of the encircling wall and bears the following inscription: "Near this spot stood the house in which was born John Knox AD 1505. In commemoration an oak tree was here planted 29th March 1881 after the wish of the late Thomas Carlyle."